La petite mangue – fish amok that will awaken your senses – Montreal restaurant | Everything Delicious. 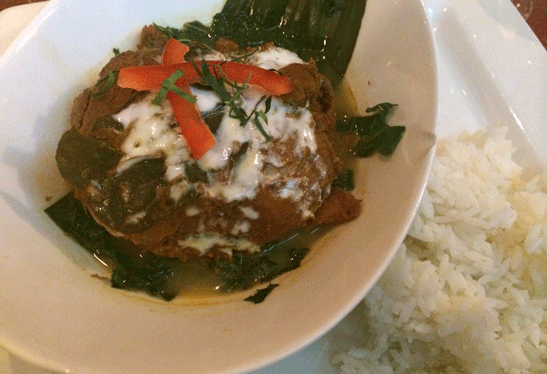 It’s pretty rare to find traditional khmer cuisine on that side of the world, so I was happily surprised by the delightful Cambodian food served at la Petite Mangue in Montreal. This Montreal restaurant offers a very reasonably priced Table d’Hôte in the evening. 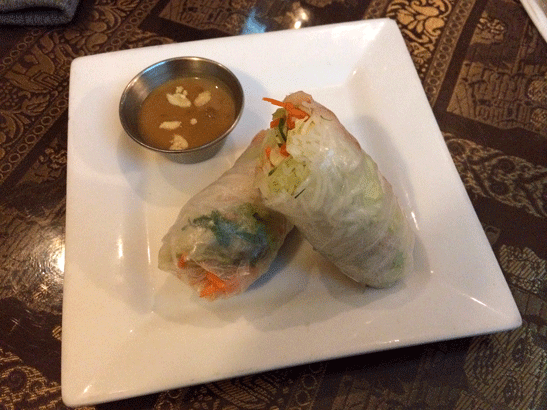 For $18, you get to choose a soup, imperial rolls or spring rolls, and a main dish from the menu. For the main dish, I had to order Fish Amok. No hesitation. I fell in love with that dish when I first discovered it in Cambodia years ago and I have not seen it on a restaurant menu ever since. Tasting it at La Petite Mangue sent me straight back to Siem Reap! Fish amok is one of the most traditional cambodian dish. It’s made of a white fish fillet covered with an aromatic kroeung (pounded shallots, lemongrass, garlic, kaffir lime), roasted crushed peanuts, coconut milk, and egg and then wrapped in banana leaves and steamed until it achieves a mousse-like texture. Soooo goooodd! All your taste buds will be on alert! My friend ordered the sweet basil eggplant which was also very flavourful! The sauce was really tasty and the dish well served with generous portion of beef and a nice mix of boiled vegetables. We couldn’t order more (unfortunately) but I have to go back to try their beef luc lac, my 2nd favourite Cambodian specialty. The service was nice and attentive but the vibe unfortunately didn’t compare with the food. The room is clean and renovated but just feels a little dull and boring. 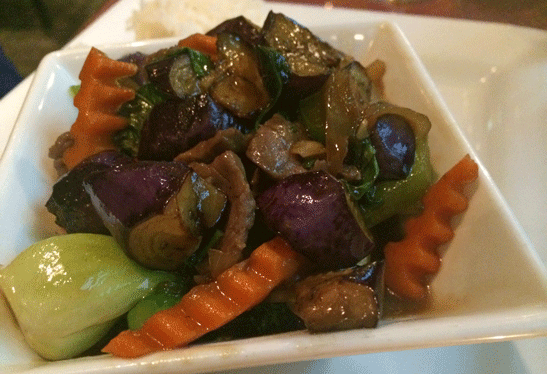 This entry was posted on March 21, 2015 by Pauline Rosen in Restaurant feed and tagged amok, asian, basil, Cambodian, eggplant, fish, montreal restaurant, restaurant montreal, spring rolls.